Delicate with a definite edge. If this is your first experience purchasing moissanite, perfect. Some feel a bit more comfortable getting a piece like a bracelet in lieu of purchasing an engagement ring, for instance. Learn more about the wonders of moissanite. Affordable, dazzling and ridiculously strong. Elegant, feminine bracelet from our “Cut Lace” Collection with Charles and Colvard created round bezel set moissanite. Do you Tell People your Moissanite Ring isn’t Diamond? I stumbled across this moissanite poll in Wedding Bee today and it got me thinking: why are so many people still so resistant to moissanite? 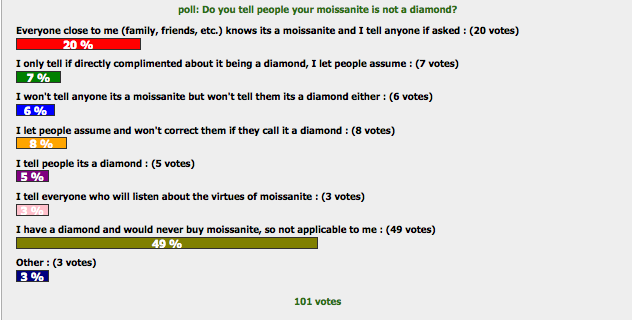 As you’ll see, 49% of the people polled wouldn’t even consider moissanite, so the poll question didn’t even apply to them. It got me thinking that we still have a lot of work to go. As the moissanite-friendly understand, choosing moissanite is a smart, ecologically and economically sound diamond alternative possessing many of the same qualities as naturally mined diamonds. It’s light years beyond a simulant such as cubic zirconia. Moissanite a lab-created diamond and is difficult for many jewelers to detect the difference. Yet we still are so attached to diamonds. Why? Probably because of a very successful ad campaign from the 1930’s that proclaimed that “Diamonds are Forever.” In our collective mind, we deeply associate diamonds with long-lasting love. Unfortunately that’s just not true. Diamonds are also associated with large-scale ecological damage to this planet and the people on it. It’s time to think outside of the “diamond box” and choose something based on the world we live in now. On Sale! Save an additional 10% with purchase of a moissanite stone and setting. Use coupon code ‘Sale10’ at checkout. This pink moissanite ring surely has to be one of the most eye-catching ring in our collection. Our clients who’ve purchased this dazzler constantly tell us how many comments they get from friends and family. But more than that, it’s visually pleasing to the wearer. These colors are so inviting and soothing that simply looking at them lifts your spirits and makes you feel special. Isn’t that what all jewelry should do? It’s also a great way to try moissanite. Some get a little nervous buying an engagement ring with moissanite but a pretty colored gem on a non-wedding ring seems a little less risky. Rose Gold Diamond and Pink Moissanite Ring Stunning, delicate 14kt rose gold engagement ring set with a 1.0ct (dia equiv) Charles and Colvard created round moissanite color enhanced to spring pink surrounded by 1/3ct t.w. white diamonds. Matching earrings also available. And at a price like this, you can’t beat it. If you’re new to moissanite, this is the perfect way to get acquainted with this amazing diamond simulant. Moissanite is so optically close to diamond that even some jewelers cannot tell the difference without the aid of various tests. Because our moissanite comes from Charles and Colvard, the creators and top manufacturers with the highest standards in moissanite, you can be assured your choice is a smart one. These earrings are delicate and just slightly ornate. A very romantic, classic look…and a great price! Stud cluster earrings with approximately 3/8ct t.w. (dia equiv) Charles and Colvard created round moissanite. Available in 14kt white gold only. Moissanite Saves the Day Again! We’ve extolled the virtues of moissanite time and time again on our blog. Not only do you get more “bling for your buck” but you also get a diamond simulant that has more fire and dazzle than diamonds and it’s eco-friendly! Win/win, right? This woman’s story describes how moissanite turned a not-so-hot gift into something she can’t stop smiling about. I wanted to take a minute to thank you and your associates Beth. I received a pair of diamond earrings for Valentine’s Day. It’s the first time in 10 years he bought me diamonds and he wanted to get me a big pair – so he skimped on quality and purchased a 2 carat pair. I opened the earrings and unfortunately (I really felt bad), I did not really care for them. They were milky in color and not what I had expected. Then I came across your site and decided to call and ask a few questions about moissanite earrings. Beth told me how wonderful they were in comparison to diamonds and the clarity would be what I was looking for. So I asked him about exchanging the ones he gave me for a smaller size (Beth pointed out 1 1/2 carats was always a good safe choice.) He was fine with saving him money (lol) since they were less then what he had paid for the other ones. I received my order today and I would have given anything to have had this reaction on Valentine’s Day!!! 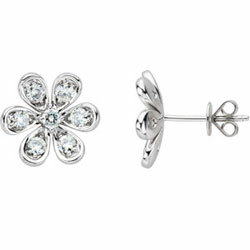 These beautiful earring sparkle like nothing else I have seen. Beth was correct the 1 1/2 carat was a much better fit. I can not stop looking in the mirror at the sparkle in my ears or wipe off the smile that has been on my face ever since. I have recently gained a daughter-in-law and have been looking for something special to get her. It won’t be my earrings but I am going to order her a pair. I mean this from the bottom of my heart: you have one very satisfied customer who will return time and time again. Thank you Beth. I hope they know how lucky they are to have you!! Charles & Colvard, Ltd., the sole manufacturer of created moissanite gemstones, has partnered with Serenity Technologies, Inc., a laboratory for gemstone enhancements, to create whiter and brighter gemstones. The company is introducing these enhanced gemstones as “FOREVER BRILLIANT™,” a new premier brand of Charles & Colvard Created Moissanite®. Handpicked and polished moissanite is enhanced, through a proprietary process by Serenity Technologies, which can make each stone up to four color grades whiter on the Gemological Institute of America’s near-colorless spectrum. “As a former jewelry retailer, I recognized the importance of being able to market a whiter gem and sought to provide one since joining Charles & Colvard,” says Randy N. McCullough, CEO of Charles & Colvard, Ltd.
“While moissanite can easily withstand very high temperatures and its covalent bonding, similar to diamond, allows it to withstand very high pressures, moissanite crystal does not respond to HPHT treatments in a fashion similar to Type IIa (virtually nitrogen-free) diamonds that can become near colorless after such treatments,” says Dr. Suneeta Neogi, president of Serenity Technologies, Inc.
Each “FOREVER BRILLIANT™” stone will be accompanied by a Charles & Colvard certification and laser inscribed on the girdle for easy identification. Charles and Colvard created round moissanite set on an 18″ cable chain. Available in 14kt white gold only. Sale! Save 30% on select items. Use coupon “Discount30” at checkout. We’re long-standing proponents of moissanite here at Joseph Schubach Jewelers. Not only is it eco-friendly (it’s not mined liked natural diamonds but created in a laboratory), but its brilliance and luster remain the same. From our side of the counter, we’ve also seen countless customers who were able to pick out their favorite piece of jewelry because of moissanite’s affordability. But people remain skeptical, thinking moissanite is just a poor man’s diamond simulant. Think again: it is a diamond. It’s simply a lab-produced diamond. •	The properties of Moissanite can be compared with diamond, and it has been found that this wonder material outperforms diamond on nearly all counts. •	If refractive index of diamond is 2.42, Moissanite has a refractive index of 2.65-2.69. •	Dispersion, also called fire by jewelers, is higher for Moissanite (0.104) than diamond (0.044). Even in luster index, Moissanite (20.4%) is much ahead of diamond (17.2%). •	It is only in hardness that diamond is ahead of Moissanite, but that too is just a little bit. •	Diamond has been given a perfect 10 on Mohs scale, whereas Moissanite is given 9.25. •	When it comes to toughness, Moissanite is labeled as excellent, whereas diamond is given a good on this count. •	Moissanite is also comparable to diamond in specific gravity. Save 30% Now!! Round Moissanite Oval Cluster Design Necklace - Click on image for more information. 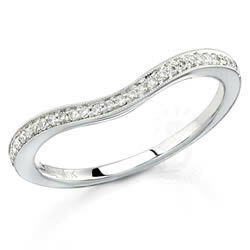 Moissanite Flow Wedding Band - Click on image for more information. Classic Prong Set Moissanite Tennis Bracelet - Click on image for more information. Once a week, we like to spotlight a certain piece in our collection that bears extra notice. Our Round Moissanite Heart Pendant is a classic, popular piece – and for good reason. Clients often tell us it goes with just about anything – whether you’re dressing up for a special occasional or need a sparkling touch with a simple, casual outfit – its just easy to wear. Then there’s the moissanite. If you’re not familiar with this diamond alternative, this necklace is a smart way to experiment with an increasingly popular gem. Many won’t sacrifice diamonds for an engagement ring, for instance, but they will in a piece like this moissanite pendant necklace, where the stakes don’t seem as high! Once they realize the luster and beauty of moissanite, they’re often hooked and don’t look back. And then there’s the heart. 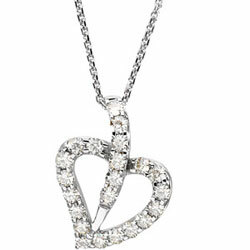 Regardless of your age or your tastes, a heart pendant speaks to all of us. It shows our openness to love. It shows others that we care. It’s a symbol that has resonated throughout time. This piece is currently $689, making it affordable to many. And it’s an addition to your wardrobe that will stand the test of time, so a smart investment as well. Click on the photo for more info or give us a call! We’re often asked how our business is faring in a trying economy. And there’s no easy answer to that question. Overall, we’ve maintained because we have a loyal customer base who’ve come to depend on our stellar service and high-tiered craftsmanship.We realize the importance of fostering our relationships with our customers…and after three generations, we think our formula works. Consumer electronics products were strong sellers in December, rising 7.3%, SpendingPulse said. Luxury merchandise, excluding jewelry, grew 5.5%, turning positive after a 7.3% decline in November, and jewelry sales rose 6.9%, their fourth consecutive monthly gain, SpendingPulse said.Still, high-end items are not capturing the most consumer dollars. Discount mass merchants like Costco Wholesale Corp. (COST) and BJ’s Wholesale Club Inc. (BJ) are again expected to show the most comparable-store growth for December, at 3.9%, while teen and children’s apparel retailers are pegged for the biggest decline, at 4.3%, Thomson Reuters said. Wal-Mart Stores Inc. (WMT) is part of the mass merchant group, but will not be reporting same-store sales after halting the practice last year. Jefferies Group feels the nation’s biggest retailer had strong December results. Wal-Mart delivered a “clear holiday sales message, combined with more aggressive pricing and easier comparisons” that produced a low-single-digit percentage gain, putting Jefferies’ quarter-to-date estimate toward the upper end of Wal-Mart’s forecast for a 1% gain to a 1% drop. So we’re seeing a little hope on the horizon, economically speaking. People are beginning to buy again, slowly but surely. At Joseph Schubach Jewelers, we realize budgets are tight and can find you a piece tailor-made to fit your checkbook. You name the price, we name the piece – it’s that simple. 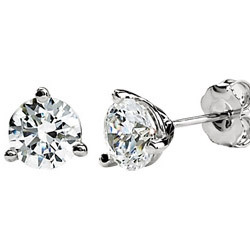 Martini style three prong earrings with Charles and Colvard created round moissanite. SAVE 60% while supplies last. Use Coupon Code “Discount60” at checkout.